easy to use (in drops). If you want more detailed information about this product, please search over the web for the manufacturers official page by inserting "Natural Wonder Pets Adadren" or contact our customer service. 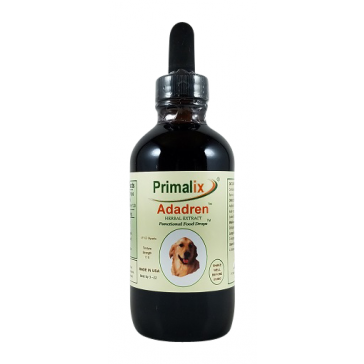 Primalix Adadren can alleviate the symptoms of Addison's disease in all dog breeds. It can be taken in addition to steroids or alone, as a natural replacement remedy. Primalix Adadren herbal is safe and effective. Our extraction solvent (menstruum) consists of our own proprietary blend of organic vegetable glycerin, apple cider vinegar, and crystal clear water which we ionize and purify through filters measuring one one-hundredth of a micron. Natural Wonder Pets ( NWP) does not extract with alcohol, which is harmful to dogs and cats, nor with heat which "denatures" the very herbal constituents that do the healing. NWP herbs are organically cultivated (USDA Certified Organic or Wildharvested) to maintain purity. Then we place them into our Full Spectrum extraction process, one precious gallon at a time, at the peak of their potency cycle, for no less than a fortnight. NWP is a time-honored tradition of tincturing that assures the constituent ratios in our extracts are identical to the synergistic nutrient ratios in the plants used. Our Primalix® Adadren TM - Functional Food Drops TM - let you add specific, beneficial, physiologically active food components (herbal nutrients) to wet or dry food. Nearly 2500 years ago Hippocrates said, “Let food be thy medicine and medicine be thy food.”Animals do this instinctively. In the wild they “functionalize” their food by sniffing out and eating specific herbs to prevent disease and maintain natural wellness. Now you can add function to any dry, canned, raw or homemade pet food. Give your domestic dog or cat a targeted dose of wild, natural wellness with every meal. NOTE: One "dropper" equals one squeeze of the black bulb (1.0mL), which fills the pipette about half full. Refrigerate after opening. Add to food or give by mouth.